Typically a varnish is what is used to protect wood that exposed to the elements for long periods of time (think teak wood on boats). Here are the links to our varnish choices to check as well. 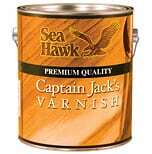 Captain Jacks Premium Varnish has been designed for the highest quality work, with outstanding results and durability. A combination of high quality pure phenolic modified tung oil provides excellent weathering performance and will enhance the richness and beauty of the wood with classic bright work appearance. BEST VALUE! Epifanes Wood Finish Gloss– Wood Finish Gloss is the ultimate varnish alternative without sanding. It is based on phenolic-modified resins and tung oil with microscopic porosity properties. Specifically formulated for oily woods like teak and iroco, Epifanes Wood Finish Gloss has an ultra high gloss finish. Its color is clear amber. One of its outstanding characteristics is its ability to build up coats quickly without sanding. No sanding is required if re-coating within 72 hours. Wood Finish gloss has excellent flow, gloss and durability and offers great flexibility and water resistance in all weather conditions. So, when its a deep high gloss finish with excellent U.V. protection and no sanding in between coats that you are looking for, Wood Finish Gloss is the perfect choice. Sold by the 1000ml (1 quart). Awl-Spar Classic Spar Varnish (with reducer) is the highest quality classic spar varnish with state of the art ultraviolet inhibitors and absorbers used for brightwork protection against water and weather. It has excellent durability, and is fast dry, fast recoat for quick build up. For above waterline use only. Cetol® Marine Gloss with Next Wave™ UV-absorbing technology is a durable clear gloss protective wood finish, developed as a topcoat for Cetol Marine, Cetol Marine Light and Cetol Marine Natural Teak. Next Wave technology is the next generation of Cetol Marine from Sikkens with a unique UV-absorbing package, which is specialty resins and advanced UV absorbers that provide greater protection, durability and longevity. Cetol Marine Gloss provides a high gloss, hard wearing, UV protection and an easy to clean finish. It can be used where a gloss appearance is preferred on top of Cetol Marine, Cetol Marine Light and Cetol Marine Natural Teak. Do not use on decks. Marine Spar Varnish is a super clear, high gloss varnish for exterior and interior use on new or previously varnished surfaces subject to abuse from parching sun, fresh or salt water, severe weather conditions or abrasion. Formulated with an ultra violet screening agent, Marine Spar Varnish will hold its gloss on exterior surfaces far better than conventional varnishes. Excellent for use on boats doors, furniture, porches, bar tops, or any other surface where a durable clear gloss finish is desired. This entry was posted in Boat Maintenance, Teak and tagged awlspar varnish, captain jacks varnish, cetol, marine spar varnish, varnish on August 19, 2014 by Jason Revie.